It’s not even that close. According to Chris Wilson’s super-fun interactive map at Time, the folks in the Manila suburbs of Makati and Pasig City post 258 selfies per 100,000 users, while we here in Manhattan are mustering 202/100K. 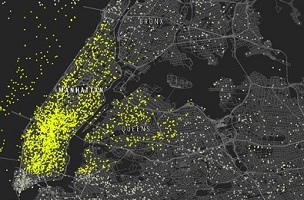 To investigate the geography of selfie-taking, Time built a database of more than 400,000 Instagram photos tagged “selfie” that included geographic coordinates. 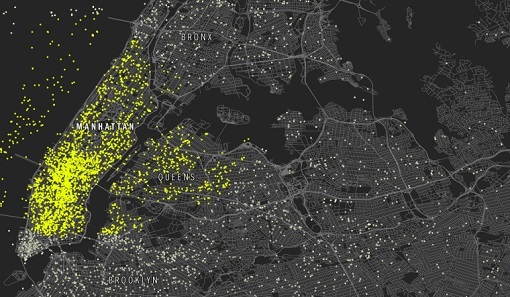 In total, we ranked 459 cities to determine the selfiest places on earth. 1) The NYC area photo above is another diametric opposite of the media trope of a darkened North Korean peninsula at nighttime. We’re guessing that if the DPRK were depicted in such an Instagram fashion, there might only be one or two dots, corresponding to wherever Kim Jong-un has been Smartphone partying recently. 3) This may be one of the rare compilations where the last-place city welcomes and celebrates a last-place ranking. That #100 honor in this case goes to the good folks of Nice, France.